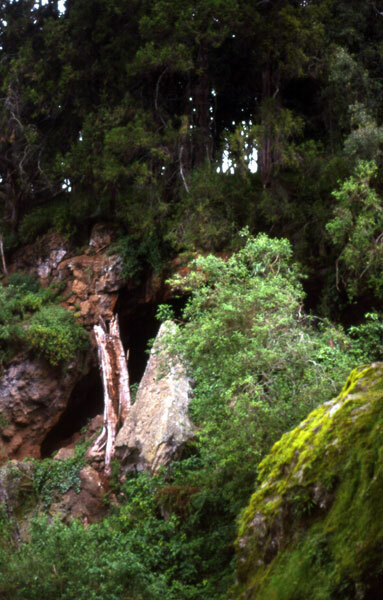 The expansive mouth of Kenya's Kitum Cave can appear out of nowhere. Mount Elgon National Park's jagged landscape, coupled with a dense cover of lush, green plant life, conceals the cave surprisingly well from human wanderers until they're right on top of it. Animals, however, have no problem finding Kitum. Fruit bats, insects, and especially elephants are frequent loiterers. The large pachyderms shelter within the 700-foot system, and also seek out a surprising snack. Using their hardened ivory tusks, the elephants dislodge stones from the cave wall and grind them to bits with their teeth, sucking up the stores of salt within. Kitum Cave is, in fact, a petrified rain forest. Seven million years ago, the volcanic Mount Elgon erupted and buried the surrounding rain forest in ash. Kitum is deep within what was once a molten sea. Mineralized logs jut out from the cave walls. So do all sorts of bones, from animals like crocodiles, hippos, and elephants. It's eerily beautiful. In 1980, a 56-year-old Frenchman living in Kenya entered Kitum cave and may have been entranced by that beauty. After a few hours of exploration, he left spellbound and in awe. But something evil left with him. Seven days later, the headache started. Fever and nearly nonstop vomiting arrived three days after that. Then the Frenchman's face became droopy and lifeless, and the skin turned yellow. His whole personality changed. Friends helped him board a plane so he could go to a hospital in Nairobi. Onboard, he continued vomiting, now heaving up a black liquid. He filled up a couple of barf bags. His nose started bleeding... and it wouldn't stop. When the plane landed, he stumbled off in a stupor, finding the nearest taxi and mumbling the words "Nairobi... Hospital" to the driver. The taxi driver was kind enough to help the Frenchman into the hospital when they arrived, and made it very plain to the attending nurse that this man was in dire need of help. Assurances were made that a doctor would see him promptly. While sitting in the waiting room, the Frenchman suddenly leaned over, vomited up an immense quantity of blood, then fell unconscious. Blood began to seep from every orifice and creep along the floor. The evil entity that originated in Kitum Cave had destroyed its host. Now, it was leaving its mangled, corporeal home in search of a fresh one. The death of the Frenchman, who science journalist Richard Preston dubbed "Charles Monet" in his 1994 book The Hot Zone, was a landmark case for the scientific study of Marburg. Not only was it the first time that Marburg had surfaced since 1975, when it infected three people in South Africa, but it also allowed investigators to try and nail down the source of the infection. Since Monet was a bit of a loner, the investigation proved difficult. Seven years later, however, Marburg reared it's gruesome head again, infecting and killing a young Danish boy in Africa. When it was discovered that the boy had visited Kitum Cave with his family 11 days before his death, investigators decided they had to pay the site a visit. In Spring 1988, a joint U.S. and Kenyan operation led by the United States Army Medical Research Institute of Infectious Disease's Gene Johnson began. Decked out in full biohazard gear, the team members scoured the cave, capturing bats, birds, and insects, sampling bat guano and elephant feces, and scraping slime off walls. At first, Johnson was sure he'd come to the home of one of nature's most ancient and proficient killers. But when all was said and done, he left empty-handed. If Marburg lurked in Kitum Cave, it had vanished without a trace. "It must have been a bitter disappointment for Gene Johnson," Preston wrote in The Hot Zone, "so disheartening that he was never able to bring himself to publish an account of the expedition and its findings." Two decades later, a cave in neighboring Uganda would divulge some of Marburg's secrets. In the wake of an outbreak among miners working at Kitaka Cave, scientists detected the virus in local Egyptian fruit bats, the same species of bat that occasionally shacks up in Kitum. The researchers esimated that 5% of the 100,000 animal colony at Kitaka was infected. It was the first time that hard data implicated bats as a major natural reservoir of the virus. Scientists still aren't sure precisely how the Ebola strain currently terrorizing Western Africa made the leap into humans. Ebola and its sibling Marburg are as mysterious as they are insidious.